This past weekend I participated in Dewey’s 24 Hour Readathon. I hadn’t intended to but I got drawn in when I saw everyone posting about it. Turns out there were a lot of perks to joining in! 1. Be Gone Reading Slump! I have struggled to maintain my usual reading pace this year and have felt a disconnect to reading in general. I finish a book (which takes me forever these days) and then take a week to pick my next read. Thankfully, the excitement of picking out books for the readathon helped me to kick my reading slump to the curb! 2. ‘Oh, Hello’ Fellow Readers. 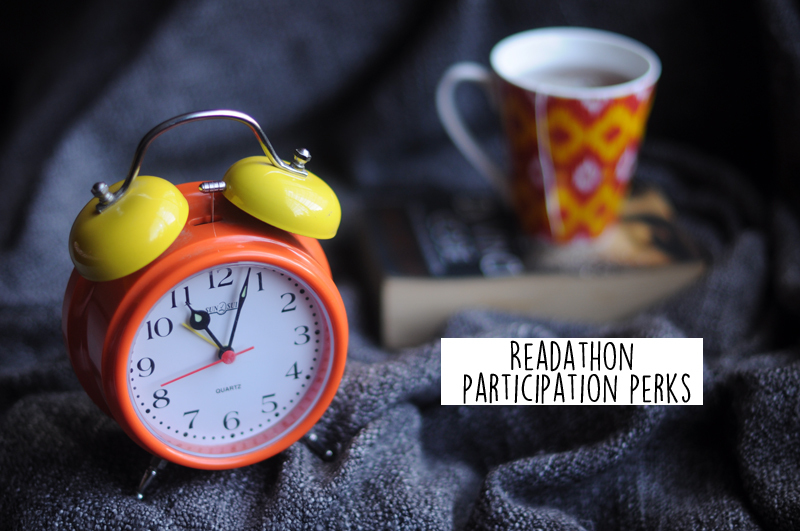 Because a readathon happens during a short amount of time, there is a lot more interaction between everyone who is participating. Everyone jumps on Instagram and Twitter and engages like crazy. It’s really fun and I enjoyed meeting some new people in the bookish community. 3. Anything counts. Often reading challenges require a lot of rules and have a lot of restrictions in order to participate. The beauty of a readathon is that you can jump in and out at your leisure. I had only a couple of hours here and there to devote to Dewey’s, but my small involvement still counted for something! 4. Recommendations Galore. So many great book recommendations popped up during those 24 hours and I didn’t have to read through a single blog post to find them. Win! 5. The Extras are Pretty Rad. Usually there are contests, giveaways, and mini challenges going on during the course of a readathon. If you have time for these things, they can be a lot of fun. So a big thank you to the organizers of Dewey’s 24 Hour Readathon. My participation is limited quite a bit more these days but I love that I can still get in on the fun. Did you participate in Dewey’s? Do you like readathons? I love readathons, but unfortunately I was working during this last one. I hope to make the one in October and will have to check when the next 24-in-48 hour readathon. I have a hard time with the random things that pop up too.